Dennis Lee Hopper (May 17, 1936 - May 29, 2010) was an American actor, filmmaker, photographer, and artist. He attended the Actors Studio, made his first television appearance in 1954, and soon after appeared alongside James Dean in Rebel Without a Cause (1955) and Giant (1956). 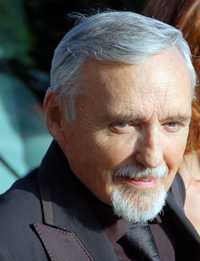 In the next ten years he made a name in television, and by the end of the 1960s had appeared in several films. Hopper also began a prolific and acclaimed photography career in the 1960s. Hopper made his directorial film debut with Easy Rider (1969), which he and co-star Peter Fonda wrote with Terry Southern. The film earned Hopper a Cannes Film Festival Award for "Best First Work" and a nomination for the Academy Award for Best Original Screenplay (shared with Fonda and Southern). Journalist Ann Hornaday wrote: "With its portrait of counterculture heroes raising their middle fingers to the uptight middle-class hypocrisies, Easy Rider became the cinematic symbol of the 1960s, a celluloid anthem to freedom, macho bravado and anti-establishment rebellion". Film critic Matthew Hays notes that, "no other persona better signifies the lost idealism of the 1960s than that of Dennis Hopper". This webpage uses material from the Wikipedia article "Dennis_Hopper" and is licensed under the GNU Free Documentation License. Reality TV World is not responsible for any errors or omissions the Wikipedia article may contain.